Taiwanese actress, Shu Qi (舒淇) made an appearance at the new store opening of Miu Miu held in Hong Kong, China on January 8, 2014. 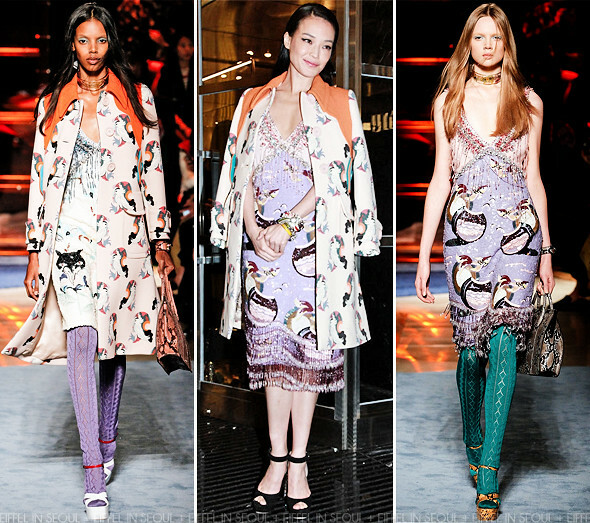 The actress opted for a printed embellished lilac dress with a printed coat from Miu Miu Spring/Summer 2014 collection. A pair of black suede sandals from the same label to complete her look. I just can't get pass how mismatched those pumps are with the printed outfit. Not her best. Can you please post with the items Ha Ji Won wore in the january edition of The Celebrity?